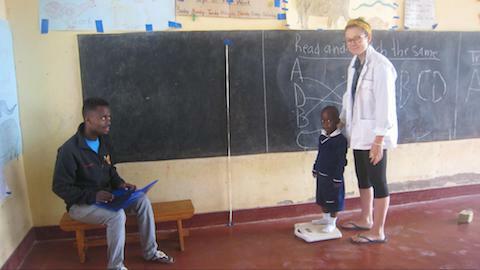 Student nurse Charlotte and John Paul combined forces to weigh and measure all 702 of our students for a growth chart to follow each year. We hope to keep a record that we can share with the parents as we watch their children grow on a yearly basis. The preschool was first on the schedule. Stepping on a scale and then backing up to the wall is not hard unless you are 3 years old and getting instructions from a woman who speaks only English. 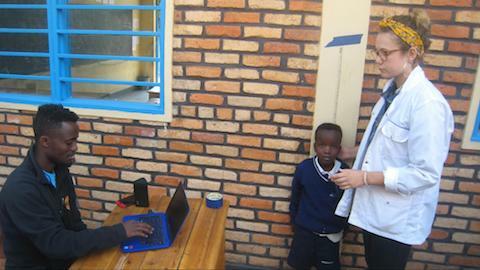 John Paul was a godsend and such a help by speaking both English and Kinyarwanda. Project moved on to the Primary School.